Things are not so great in the land of the Los Angeles Dodgers, not even when their players aren’t playing for them. During a 7-4 loss to the Salt Lake City Bees, a game in which, according to Fox 13, “Thousands of fifth and sixth-grade students were in attendance at the game as a reward for their participation in the ‘Prevention Dimensions’ program,” designed to help students prevent substance abuse and violence, an argument between Alex Guerrero and teammate Miguel Olivo escalated to fever pitch, ultimately culminating in a Mike Tyson-esque bite to Guerrero’s ear. The altercation seems to have stemmed from an argument the two were having in the seventh inning, and by the eighth it had escalated from taunting to chewing. 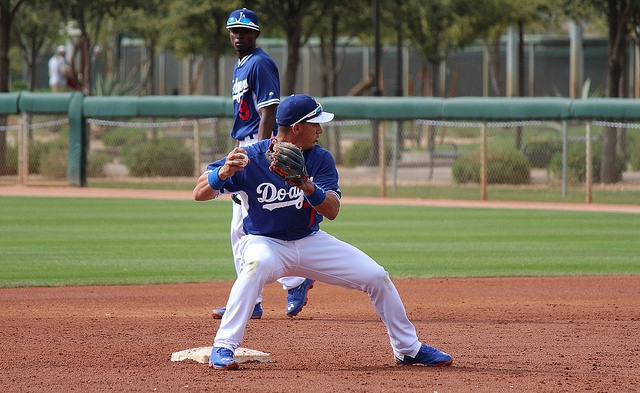 Guerrero, who started his season with the Los Angeles Dodgers before being moved down to the Albuquerque Isotopes when the Triple-A season got underway, struggled in the majors but has picked it up after being sent down. One assumes that his current injury would delay any kind of return by some time, though. The video footage of the seventh-inning argument, which you can see above, is unpleasant. It also marks the latest in what has to be considered a string of incidents for Olivo, who first came to baseball fans’ attention in a negative light during a scuffle with Jose Reyes in 2007. Boras told the Los Angeles Times that the catcher blamed Guerrero for a stolen base after the second baseman failed to tag out a runner after receiving a pass from Olivo. In the eighth inning, “Guerrero was in the far end of the dugout. He went to the front to get his bat and helmet to hit. As he walked across, Olivo decked him,” the agent said, before adding that this kind of incident was a first for him in more than 30 years of player representation. The Isotopes are currently in possession of a losing record, and Guerrero is in the first year of a $28 million deal he received from the Dodgers.